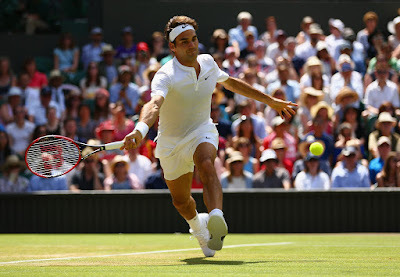 Roger Federer extended his Grand Slam winning streak against Australians to 19 matches on Saturday when he booked his spot in the fourth round of The Championships. The second seed and seven-time champion beat Sam Groth 6-4, 6-4, 6-7(5), 6-2 on Centre Court in two hours and 16 minutes. Groth claimed a mini-break for a 4/3 lead in the tie-break and went on to win two further points. Federer won back two of Groth's set point opportunities, but a forehand down the line that landed wide handed the World No. 69 the set. Federer bounced back immediately, opening up a 3-0 advantage en route to improving to a 76-9 record at the grass-court major. Federer is now 19-1 against Australians at Grand Slams, having lost to former World No. 1 Pat Rafter at 1999 Roland Garros. He hit 17 aces to Groth's 21 aces, and lost just seven of his first service points in the pair's second meeting. "I am very happy. It has been a hot week the first week but thankfully I have had easy matches going through without too many long four or five setters. Now we are looking ahead and there are only big matches." said Federer. When asked how he goes about facing a big server, Federer admitted, "The only thing I really have to change is my returning. The rest, the service games, I can control them myself: what to do on second serves, what to do on first serves. Once the return is played, then it's about reaction, especially when he's serve‑volleying... I think that's the biggest effort for me anyway, when I play a big server, is understanding those patterns." Federer emphasised what a difference he felt the extra week’s preparation for The Championships has made to his tennis. "I'm not coming into Wimbledon being not quite sure about my game," he said. "Three matches and no breaks faced - it’s great. I couldn’t do it in Halle, which was more all over the place in the beginning. I’m in a more solid place. It’s going to help a lot of players improve on grass." Federer will now play Roberto Bautista Agut, the No. 20 seed, for the third time. The Swiss beat Bautista Agut at last year's US Open and the Shanghai Rolex Masters. Bautista Agut made just eight unforced errors in a 7-6(4), 6-0, 6-1 win over World No. 153 and qualifier Nikoloz Basilashvili in one hour and 36 minutes. It was his sixth win in eight matches at the All England Club.